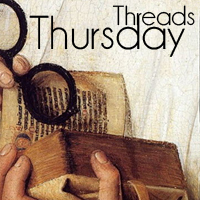 Historical Tapestry: Thursday Threads - Where and When are you reading? Thursday Threads - Where and When are you reading? Where and when are you reading this week? Julie - I am in the middle of 3 books, and I hate that! I am reading about India in The Fishing Fleet: Husband-Hunting in the Raj by Anne de Coursy. I am about to start reading a book for the book group Dona Nicanoras Hat Shop by Kirstan Hawkins and I am reading Bird by Bird by Anne Lamott for my virtual book group. Marg - I have been spending time in the court of the Sun King in Versailles and in Venice a couple of hundred years prior. I have been reading Bitter Greens by Kate Forsyth - a great historical fiction read that also includes a retelling of the Rapunzel fairy tale! I'm in England in the early 11th century with Emma of Normandy, who has just become English queen by marrying Aethelred. I'm reading Shadow on the Crown by Patricia Bracewell. I'm also in late 19th century England with Lady Julia and Nicholas Brisbane in Deanna Raybourn's The Dark Enquiry. I will be reading the Bracewell book soon! And LOVE Lady Julia and Nicholas Brisbane! These titles are all new to me and sound interesting. I just started World without End by Ken Follett in the 14th century. I just read that Edward II was dethroned and died somewhat suspiciously in prison. I'm barely in and already hooked! I don't know much about this time period, so I'm excited to learn. Another author I need to read one of these days! I am not reading any historic fiction which is a first this month but I am reading Mila 2.0 which is a futuristic novel. I did just finish 2 books Women of the Book of Mormon by Heather B. Moore and Asunder by Jodi Meadows but hope to start reading a HF soon. I'm in 19th century China finding it hard to believe how society treated women in Snow Flower and the Secret Fan by See, almost finished at my school library with Victoria: May Blossom of Britannia by Kirwan, at our book club halfway point of Code Name Verity by Wein, AND just about done with The Hunter by Lescroart. I should finish three of the four this weekend. Enjoying ALL of them! Love Lisa See's books! And I really need to read Code Name Verity! I just finished a cozy so I am inbetween books. Tomorrow I will begin CJ Sansom's Revelation set in the era of Henry VIII. I love cozy mysteries and Henry VIII is my favourite Monarch, so might try this one! I am in Angkor (Cambodia) in 1177 with the Chams and Khmers. John Shors, Temple of a Thousand Faces. One of these days I am going to try a John Shors book! I'm in seventeenth-century England in the run-up to the Civil War, in Oxfordshire (Banbury) and London with Stella Riley's "The Black Madonna". Oh, I love that time frame! Might have to take a look at this one! I am w-a-a--y back in ancient Egypt. Just finished Pauline Gedge's fabulous trilogy on Amenhotep Son of Huy (The Twice Born, Seer of Egypt, The King's Man.) She really hits her stride with this series - great imagery, and the series serves as back-and-middle story to other novels she's set in 18th Dynasty Egypt. If you like ancient worlds, I highly recommend these!